The Atkins diet has been around for decades now. There have literally been tens of thousands of people who lost considerable amounts of weight by utilizing it properly. However, there is a flip side to this. There are countless others who have failed to shed a single pound from this well-known weight loss program. Those who have tried and failed, probably think this is a simple case of "what works for some, doesn't always work for others". I enjoyed the book, it was very informative. By: Robert C. Atkins M.D. 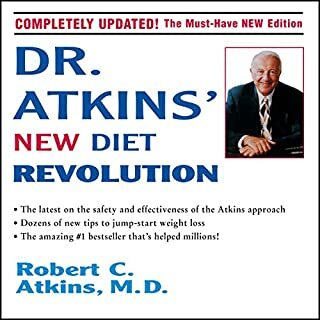 Dr. Atkins' New Diet Revolution has helped millions lose weight and get healthy. Now the world's #1 diet and complementary medicine expert has updated his proven program for a new century, offering essential new information based on scientifically supported controlled carbohydrate principles. Millions of people around the world have already discovered the Atkins Nutritional Approachand the remarkable benefits of controlling carbohydrates. 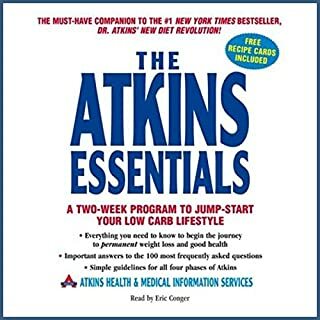 Now it's even easier to join the revolution, lose weight, and get healthy the proven Atkins way! 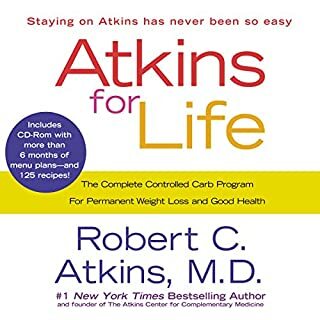 Whether you've lost weight doing Atkins and want to make your success permanent or you're new to Atkins and are concerned about your health and weight control, Atkins for Life is for you. Filled with advice and tips on navigating the everyday challenges that come with eating low-carb in a high-carb world, this audiobook provides a simple and straightforward lifetime program that anyone can follow. 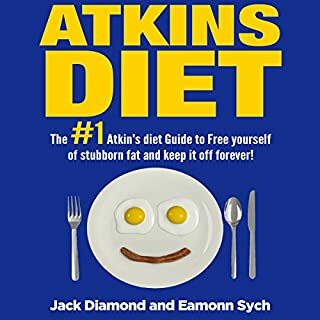 The #1 Atkins Diet Guide to Free Yourself of Stubborn Fat and Permanently Keep It Off! Weight loss involves more than just cutting out certain foods form your diet - you need to replace your bad eating habits with healthy ones. 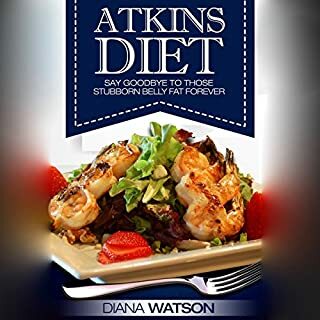 The #1 Atkins Diet Guide to Free Yourself of Stubborn Fat and Permanently Keep It Off! explains the different elements of the diet. You'll learn how it works, and what you can do to get started today! When what you’re doing isn’t working, The Keto Beginning is the rocket fuel for achieving flawless health and effortless weight loss through sound nutrition practices and vibrant food preparation in ways you’ve never seen before. Seventeen chapters and over 70 high fat, low carb, moderate protein, dairy-, gluten-, sugar-, grain-, legume-free recipes, including a 30-day step-by-step meal plan. This is the lifestyle change that empowers your body and mind to achieve the state of health you’ve been searching for. Building upon this critical work in Good Calories, Bad Calories and presenting fresh evidence for his claim, Taubes now revisits the urgent question of what's making us fat - and how we can change - in this exciting new book. Persuasive, straightforward, and practical, Why We Get Fat makes Taubes' crucial argument newly accessible to a wider audience. Manage carbohydrate and not caloric intake! Are you exhausted from researching and attempting new fad diets, only to be constantly disappointed with your results and decreasing budget? Well, you have come to the right place! I know you have not purchased this book yet, but I still congratulate you! If you came across this book, you are on the hunt for useful information on ways that you can transform your beautiful self into a person you can love each and every day instead of insulting your body! Atkins Diabetes Revolution will help you find out if you have the metabolic syndrome, identify your risk for diabetes as soon as possible, make permanent lifestyle changes to normalize the underlying metabolic imbalances that lead to type 2 diabetes, reduce your chances of suffering a heart attack, stroke, and even some cancers, and reduce your risk of heart disease by lowering your triglycerides while increasing your HDL ("good")cholesterol. What if we told you that there was a diet out there that wouldn't leave you feeling hungry, where you could eat most of your favorite foods, and you would still lose a considerable amount of weight? Does this sound like a mirage or a far-fetched dream? You're not in the midst of a slumber, it's a reality! 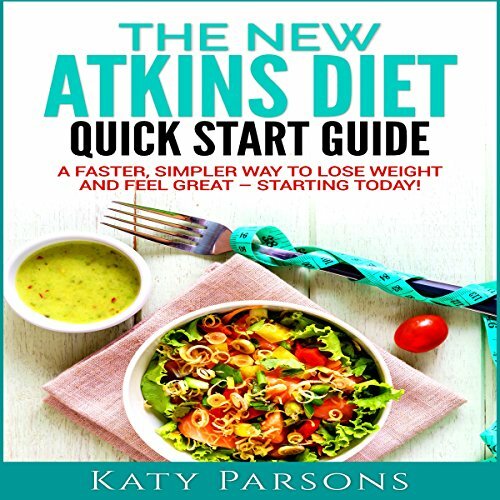 The New Atkins Diet Quick Start Guide will show you how you can eat until you are totally satisfied, whilst also seeing the numbers on the scales rapidly decline. 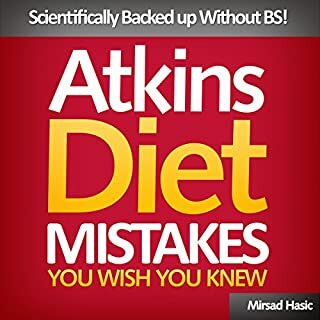 The Atkins Diet has undergone many changes over the years and it is now easier than ever to follow. This book will show you exactly what you need to do in order to follow the diet correctly, including what you can and can't eat, how to eat it, when to eat it, as well as giving you all the information you could possibly need to ensure a smooth and easy journey to your weight loss goal.